Well that was a muddy old weekend!! Another Saturday and another big race winner from Paul Nicholls, this time in the shape of SILSOL who landed the Welsh Champion Hurdle in authoritative fashion. The last two renewals were also run on similarly heavy ground. That’s serious form. SILSOL won this years renewal from a mark of OR 151 (aided by Jack Sherwood’s 7lb claim). He looks a serious prospect and he should be followed with interest going on from this. One word of caution, however; he is a German (GER) bred!! German bred (GER) hurdlers are 0/101 at the Cheltenham Festival since 2002!! 101 German bred (GER) runners have lined up in a hurdle race at the Cheltenham Festival since 2002 and ALL 101 have been beaten!! In fact only 13 have managed to place. Sheesh! The Germans do not like the Chelenham hurdle track in the springtime. Fact. I expect one to pop in at some stage. This won’t go on indefinitely. At present, however, the stats suggest we need to be avoiding them. There hasn’t actually been any word of SILSOL turning up in a Festival race but if he did he would have to have ROCK SOLID credentials for whichever race he was lining up in for me to turn a blind-eye to those German bred stats. Aintree may be the best option for him in the spring but even if he misses the spring festivals altogether he does look a serious prospect in the long-term, probably over fences. Paul Nicholls isn’t afraid to blood young up and coming jockey talent and in Jack Sherwood he looks to have unearthed a gem. It’s safe to say that is a flourishing set of figures, despite the limited data-set. He’s a jockey that is clearly going places and Paul Nicholls, rightly so, will milk his claim for all it’s worth. 3. Tony Martin is plotting…as usual!! It was Cheltenham Trials day at Musselburgh on Sunday and in the concluding Pertemps Qualifier there was a typically sneaky run under the radar from Tony Martin’s EDEYMI. His never nearer 4th gets him qualified for the Pertemps final at the Festival in March, a race that clearly looks the main target for this 7yo. They tried to get him qualified in the Leopardstown qualifier over Xmas but that was his first run for well over a year and he could only manage 11th that day. With that run under his belt, however, they had a fitter horse on their hands for this task and they were able to nudge and nurdle the horse into a qualifying slot without seriously threatening the winners spot (the stewards had a look, didn’t see anything wrong, job done as far as Martin was concerned). The interesting thing about this horse is that he already has some solid Cheltenham Festival form to his name with a decent 2nd in the 2012 Fred Winter behind Une Artiste. 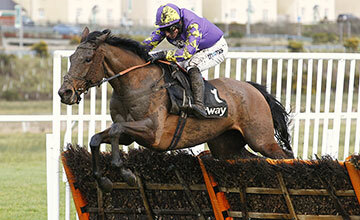 He also ran in the 2013 Martin Pipe Hurdle but was brought down 3 out before he could get involved. He ran off OR 139 in the Martin Pipe and OR 135 in the Fred Winter (the same as the mark he ran off in the Musselburgh race) so if he gets in the Pertemps this year (bottom weight last year was OR 135, same as year before) he will most likely be at the foot of the weights and running from the same mark that saw him go very close in the 2012 Fred Winter. The quiet ride from the inexperienced 7lb claimer (from what I can see he is yet to win a race under rules) at Musselburgh was clearly a qualifying job and nothing else. Essentially it was job done and the Martin plot is brewing nicely. Did you see ruby in Leopardstown Ireland riding one of Tony Martins in a pertemps qualifier this has plot written all over it will not say the name but you can work it out by checking if so desired. Yeah I think I know the one you are on about, finished 4th, never likely to finish better than that, same race over Xmas as Edemyi. What do you think about how the goingstick compares to official going? I wish the going stick readings were available more readily personally and we were able to analyse the form using the going stick readings. That way we would be able to determine, for example, that a horse was at it’s best on a going stick reading of between 3.5 & 5.5 but didn’t run to it’s best outwith that. That would surely give us more reliable data to work with and I wish there were online formbooks that allowed us to search a horses form in that manner. I’m with you on that one. I have reservations about some readings that are given as courses are loath to have extremes of ground, more so on the flat. Very much so Ian. An independent person/group to declare the going is a must in my opinion. Great read Ben, await your next article with much anticipation. Any inkling as to the Cheltenham target of Henry de Bromheads Shanahans Turn? Personally I think they should go the JLT route with Shanahans Turn, he has speed in his pedigree. He probably will stay 3m well enough in time but for now I would think shorter trip would suit. Couldn’t agree more seemed to be cruising into the straight at Leopardstown last time and didn’t seem to get home, possibly the ground but has previous form on soft/heavy!!! Yeah he could just be one of those who will stay in time but at the minute I would think they need to stick to the shorter trips.